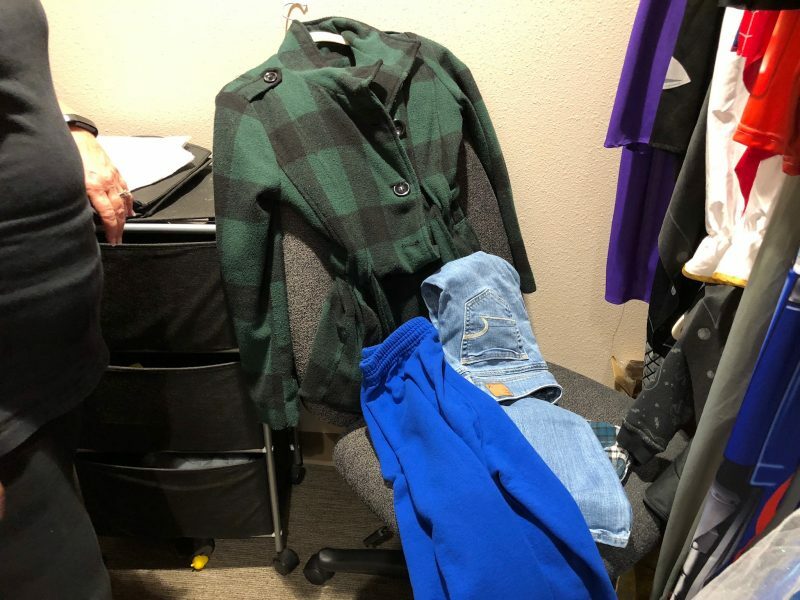 Did you know that in addition to a supply closet where we keep all our games and toys, we also have a clothes closet? This is where we work on things like putting clothes away and putting things on hangers. We also have costumes here for dress-up. Clothes are often a struggle for our kids with tactile issues. Our sensory kids are often very sensitive to textures. This can create a problem when the seasons change and it’s time to get out the cold weather clothes. The textures of many jackets and sweaters are not very friendly for our kids. It’s very important that you include your kiddo when you’re shopping for clothes that will have textures. We know many parents do the shopping on their own. If you do, remember to be texture-sensitive. And remember that if you shop online, you usually can’t tell what the texture is. And for some kids, this is a milder issue and it may not matter too much. But some of our kids are very sensitive and this is a huge issue. So for those really sensitive kids, we recommend taking them with you to buy clothes and letting them feel the item. This is especially true for undergarments. When shopping for undergarments. It really is best to bring your kiddo along and find something that has the texture they like, and maybe a character on it that they like. Here in our clinic closet, we have a pair of soft, fluffy pants with an elastic waistband. It’s one of our kids’ favorites! Jeans can be a struggle—some of our kids love them, others find them too restrictive. Pendleton shirts can be good if they’re a soft texture. If you are going to have your child put on clothing that has a rougher texture, you can have them put on something like a soft cotton undershirt underneath, to protect their skin from the roughness. And remember, there are training times, and then there are times you don’t want to fight that battle, especially if you’re going out someplace quickly. Maybe you’ve got to be at an event and you want your child to be in a good mood. That’s not a great time to do tactile training! You have to pick and choose your battles. We work on texture issues, but we also don’t want to make your family gathering times or your special even times a nightmare. When you’re not in a hurry and there’s nothing going on, you might be able to take the item with a rougher texture and ask your child to wear it for maybe 15 minutes. Or use your reward system: have them try the clothing on, and then give them a reward. Some of our more severely affected clients aren’t really aware of changes in weather. If your kiddo is in a tank top and shorts when it’s 35 degrees outside, they’re not really aware of how to dress appropriately for the season. If that’s something that you notice with your kiddo please point that out to your therapist. We find that with many of our kids they are more likely to go with the things they like instead of something that’s functional. We want to make sure they can make functional choices, and we have some great strategies for working on that!